Author(s): Ashesh Nandy, Centre for Interdisciplinary Research and Education, 404B Jodhpur Park, Kolkata 700068, India. Sumanta Dey, Subhash C. Basak, Dorota Bielinska-Waz, Piotr Waz. Background: The recent epidemic of Zika virus infections in South and Latin America have raised serious concern on its ramifications for the population in the Americas and spread of the virus worldwide. The Zika virus disease is a relatively new phenomenon for which sufficient and comprehensive data and investigative reports have not been available to date. Results: The phylogenetic relationships show that the African and Asian-American Zika virus genomes are grouped in two clades. The 2D plots of typical genomes of these types also show dramatic differences indicating that the gene sequences at the 5’-end coding regions for the structural proteins are rather strongly conserved. Among other characteristics, the transition/transversion ratio matrices for the sequences in each of the two clades show that analogous to the dengue virus, the transition rates are about 10 to 15 times the transversion rates. Conclusion: These findings are important for computer-assisted approaches towards surveillance of emerging Zika virus strains as well as in the design of drugs and vaccines to combat the growth and spread of the Zika virus. 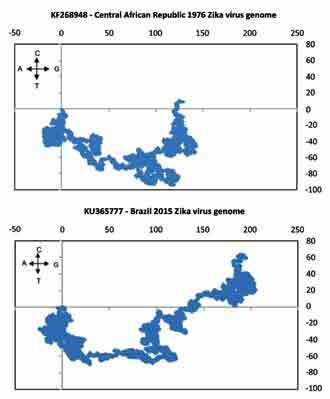 Keywords: Zika virus, Zika virus phylogeny, Zika virus characterization, African and Asian-American clades, 2D graphical representation, amino acid changes, cladewise transition-transversion ratios, Zika sequence descriptors. Affiliation:Centre for Interdisciplinary Research and Education, 404B Jodhpur Park, Kolkata 700068, India. Keywords:Zika virus, Zika virus phylogeny, Zika virus characterization, African and Asian-American clades, 2D graphical representation, amino acid changes, cladewise transition-transversion ratios, Zika sequence descriptors. Abstract:Background: The recent epidemic of Zika virus infections in South and Latin America have raised serious concern on its ramifications for the population in the Americas and spread of the virus worldwide. The Zika virus disease is a relatively new phenomenon for which sufficient and comprehensive data and investigative reports have not been available to date.